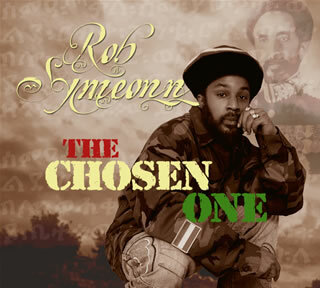 Brooklyn, NY, September 23, 2006: Highly acclaimed conscious singer Rob Symeonn, “The Spark Igniter” will be blazing the Reggae scene with The Chosen One, his debut album for Redbud Recordings on November 7th. Named for the hit title single, The Chosen One pours Symeonn’s sweet, smokey vocals over the heavy drum and bass sounds of classic Roots reggae. With searing social commentary and empowering lyrical content, the album seeks to fill in the missing gaps in contemporary music. The album boasts 17 of Symeonn’s tailor-made Roots tunes with rifts and melodies created in collaboration with some of Reggae’s legendary musicians including Val Douglas, Noel Alphonso (son of legendary Skatalite Roland Alphonso), Bongo Herman, Dalton Browne, Kevin Batchelor, and Andy Brassford. The Chosen One also features guest appearances from Junior Kelly, Terry Ganzie, Willow Wilson, and Simple Man, with stellar production for Noel Alphonso, Victor Ticklah Axelrod, and Brooklyn’s DJ Mikey Assassin of Demolition Sound. The first releases, the title single “The Chosen One,” and “Cold Outside” have been embraced by Hot 97, New York City’s top urban radio station, enjoying heavy rotation on Bobby Konders and Jabba’s On Da Reggae Tip show. The singles have also been enjoying regular airplay on WBLS’s Carib Fever with New York’s staple Caribbean radio personality Dahved Levy. Overseas stations such as Sweden’s P3 Rytm, Rise Up 99.3FM in Lyon, France, and Spain’s Bass Culture 91.4 out of Madrid, have also picked up the tunes in addition to internet stations from Canada, England, and Hungary. “The Chosen One” has also been featured on high-profile compilations such as J Boogie’s Dubtronic Science, and Riddim Magazine’s 2006 summer promotional CD. Migrating from the Caribbean to Brooklyn, NY as a child, Rob Symeonn got his start singing on Flatbush’s famous One Love International Sound System. His first single “Anything for Jah” was released on Easy Star Records in 1997. The follow up single “Delilah,” a combination tune with veteran deejay Ranking Joe, gained a lot of momentum in the States and the Caribbean. THC Music in Hawaii released his first full-length album, Abso-Rootly Hot, in 2001. He has shared the stage with notable foundation Reggae artists Wailing Souls, Sister Carol, and The Meditations, as well as celebrated contemporary acts I-Wayne, Fantan Mojah, Bitty McLean, and Khari Kill.